This 2 door vanity unit is another new take on Deco bathroom furniture; it's not a shape from the original Deco period but it is unmistakeably Deco. The 2 rising sun stained glass door panels are authentic Deco style, & really make the piece. You can change the glass design if you have something else in mind. We could even fit interior lights if you wanted to highlight the glass designs & colours for mood lighting. The stepped plinth adds more deco detailing. The handles are an elegant classy look, in chrome & clear acrylic. Fitted internally with a shelf. The vanity unit is shown with a matching oak top, but could be fitted with any colour / type of marble, granite, Corian, etc top. This can also be supplied as a 4 door version, as shown below. 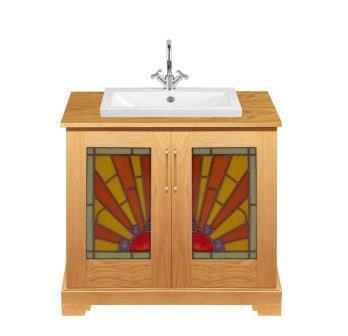 We could design your bathroom around this piece, including matching window stained glass panels. The vanity unit is shown in Oak, but could be made in another wood finish, or would look great painted. 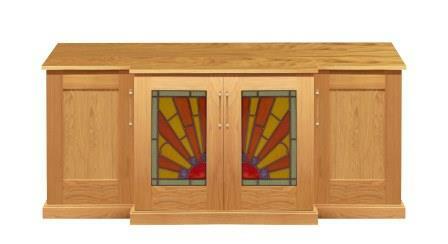 The stained glass colours could be adapted to the exterior finish you prefer. Above is shown a 2 door version of the cabinet with a Skyscraper style matching mirror. You can change the proportions as required, as this is made to order. You could several types of sinks for the vanity, depending on your preference. You could also have a small upstand at the back of the worktop. As made to order we don't give sizes until we've agreed a spec with a customer. Shown above is a 4 door version of the Vanity unit (minus sinks & taps). The breakfront, the square boxy shape & stepped plinth are typical Deco elements. 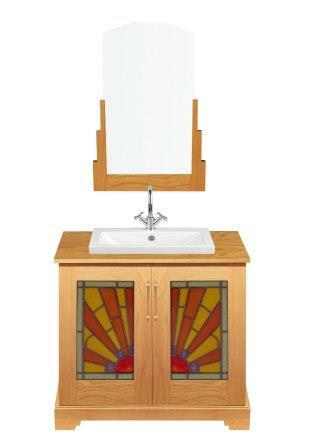 You don't need to have the breakfront, it could have a flush front - which suit a double vanity unit. This could be freestanding look or built in. If you prefer built-in furniture, could could also use a false door to conceal a WC cistern, for a clean contemporary look.